Put waffles on the breakfast menu. For this recipe, make the batter ahead, chill overnight, and bake first thing in the morning. In a large bowl stir together flour, sugar, yeast, vanilla (if desired), and salt; add milk, eggs, and oil. Beat with an electric mixer until thoroughly combined. Cover batter loosely and chill overnight or up to 24 hours. Stir batter. 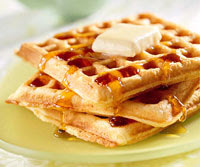 Pour about 3/4 cup batter onto grids of a preheated, lightly greased waffle baker. Close lid quickly; do not open until done. Bake according to manufacturer's directions. When done, use a fork to lift waffle off grid. Repeat with remaining batter. Serve warm. Discard any remaining batter. Makes about 16 (4-inch) waffles. Overnight Cornmeal Waffles: Prepare as above, except reduce flour to 1-1/2 cups and add 3/4 cup cornmeal. Calories 133, Total Fat 6 g, Saturated Fat 1 g, Monounsaturated Fat 0 g, Polyunsaturated Fat 0 g, Cholesterol 29 mg, Sodium 94 mg, Carbohydrate 16 g, Total Sugar 3 g, Fiber 1 g, Protein 4 g. Daily Values: Vitamin A 0%, Vitamin C 1%, Calcium 4%, Iron 6%. Exchanges: Starch 1, Fat 1. This entry was posted on 8:43 PM and is filed under Diabetic . You can follow any responses to this entry through the RSS 2.0 feed. You can leave a response, or trackback from your own site.